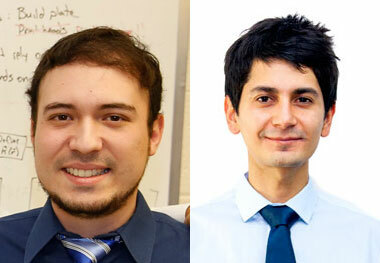 University of Texas at El Paso Department of Electrical and Computer Engineering doctoral students Jesus Gutierrez and Cesar Valle have been selected for fellowships to promote their research work. "These fellowships are recognition of two outstanding students from the El Paso/Juárez metropolitan area," said Miguel Velez-Reyes, Ph.D., Department of Electrical and Computer Engineering chair and professor. "They also provide needed financial support for them to continue toward their doctoral degrees." Gutierrez received the Anita Mochen Loya Graduate Engineering Fellowship. The fellowship is named after UTEP alumnus Mike Loya's mother. Mike Loya has been a major donor to both the College of Engineering and the University at large. "It is an honor to be a recipient of this fellowship," Gutierrez said. "It feels great when my hard work and dedication to my studies is recognized by UTEP and motivates me to work even harder. This fellowship will help me greatly toward my goal of getting a Ph.D. in electrical engineering so that I can make important contributions to the ever growing research in STEM at UTEP." Gutierrez studies transformation optics and is designing invisibility cloaks with metamaterials. His ultimate goal is to develop a functional cloaking device that conceals objects from the naked eye. Valle received the Murchison Graduate Engineering Fellowship. "This fellowship will allow me to grow as an individual at UTEP by continuing to work at a research lab," Valle said. "I look forward to all the goals my colleagues and I at the EM Lab can achieve." Through his research, Valle has found ways to improve the amount of energy that can be used from solar cells. His goal is to make computers transmit data using light instead of electricity, which he believes will make them much faster.